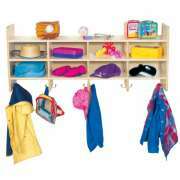 Where should preschoolers keep their things in the classroom? 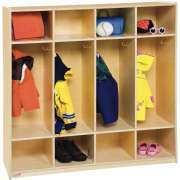 Preschool lockers offer clear personal spaces where young students can store outerwear, backpacks and more. Spacious designs in attractive wood and laminate will fit right in with your other furniture and help keep your learning space organized. 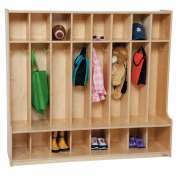 It is worth dedicating some of your space to daycare lockers so little ones can easily access the things they need throughout the day. 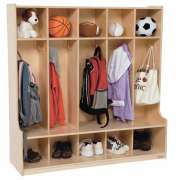 With designated spaces for personal items, it is less likely that personal property will get lost or mixed up. 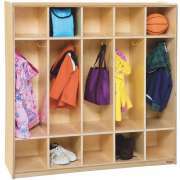 Preschool lockers have lots of advantages for both teachers and their students. How can I keep preschool students organized? 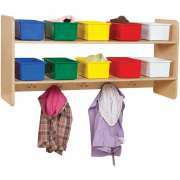 Classroom organization is extremely important in any early-childhood setting. In addition to keeping your supplies organized, it is important to ensure that little ones’ personal belongings are taken care of as well. 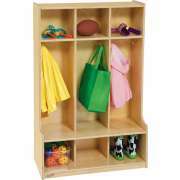 Preschool lockers are a great tool for keeping each child’s bag, coat, boots and projects in a personal space so they will always know where their things are, and the teacher will too. This is a convenient setup because it also makes it easy to ensure that student projects are returned to the rightful owners and important fliers are given out to each and every child. What belongs in a preschool locker? 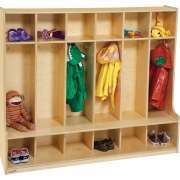 There are lots of things that can go in daycare lockers, but they are generally used for students’ coats, bags and lunchboxes. Most include an upper compartment which is good for things that stay in school such as a change of clothes or a personal smock. 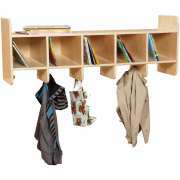 The large section in the middle is where students generally hang backpacks and coats. 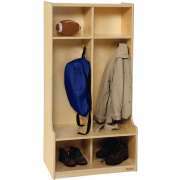 The bottom compartment offers the perfect space for boots on rainy or snowy days. 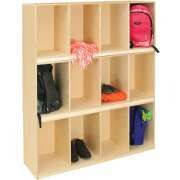 If you want to save floor space or you are on a tight budget, wall-mounted kids lockers are an excellent option. 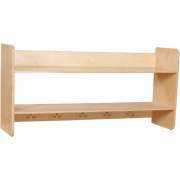 They can go just about anywhere and offer similar benefits to full-size models while taking up less space. 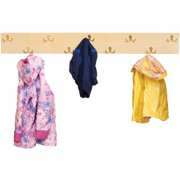 This is a good option for older students who can reach higher hooks more easily and are less likely to get their things mixed up. 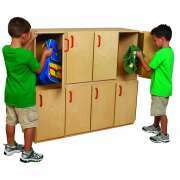 What kinds of preschool lockers are there? 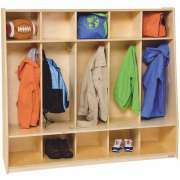 Most of the designs Hertz Furniture offers are wooden lockers, though there are some laminate options as well. 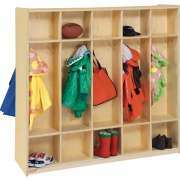 Wood has a natural appeal that coordinates with other preschool storage. If you want to add some color to your space, models are available with bright accents. Models are available both with and without doors. For little ones, it’s usually better to choose designs without doors. However, doors do make a classroom look neater and for older kids they feel more like classic school lockers. 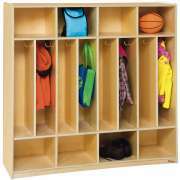 With our selection of children’s lockers, you can choose as many compartments as you need to accommodate your students. 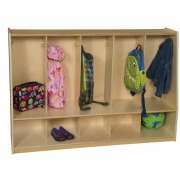 Models with shelves above can be used with cubby bins for personal or classroom storage. 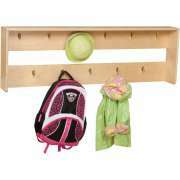 Built-in benches offer a comfortable and convenient place for little ones to take their shoes and coats on and off.